WELDON, N.C. – On October 20, as part of the Fall Fest activities on campus, the Halifax Community College (HCC) students, faculty and staff honored those in the community who have fought or are fighting breast cancer. The Student Government Association (SGA) representatives worked together to bring three breast cancer survivors for the ceremony. Each of the three survivors represented the face of breast cancer – those currently fighting, the survivors, and those who lost their fight. 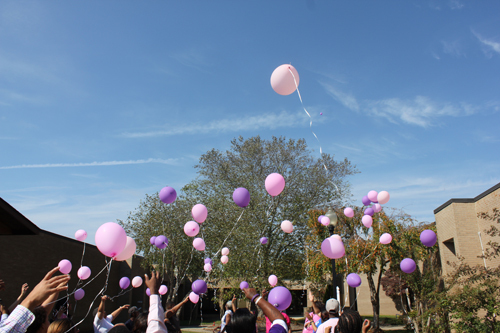 After lighting candles to honor each of the three groups, all those gathered took a balloon of pink or purple. Standing in a circle, the group chanted, “Early testing saves lives!” Finally, they released the balloons in to the sky over campus, reminding anyone who looked up that HCC stands with breast cancer fighters. The event is one of many that are happening across campus during Fall Fest, and was an important moment for many students. Honoring those who have been touched by this dreaded disease was vital to many students, and a moment they looked forward to all week.